Popular messaging service WhatsApp on Tuesday debuted its first native desktop client for Mac, introducing users to yet another comprehensive multi-platform solution that will compete with Apple's own Messages product. 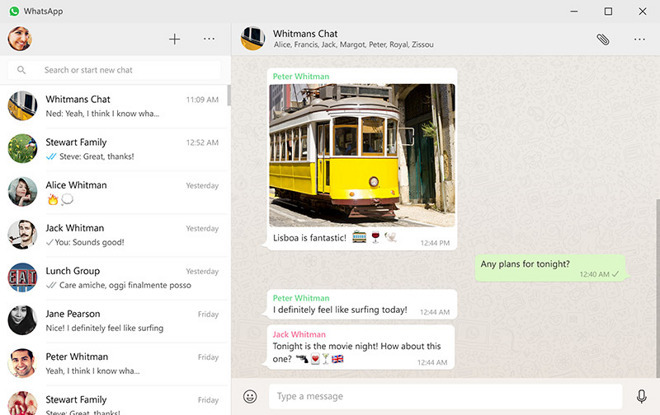 Like its Windows counterpart, also released today, WhatsApp for Mac acts as an extension to existing mobile services, syncing conversations and messages between multiple devices to bridge the gap between multiple platforms. It also makes the service readily accessible from more machines. The Facebook subsidiary announced the desktop client in a blogpost earlier today. The app is native to OS X, meaning users running OS X 10.9 and above can enjoy full support for message push notifications, keyboard shortcuts and other advanced integrations. As with competing services, WhatsApp syncs across devices, meaning users to receive and respond to messages on the platform of their choosing. Today's release comes one month after WhatsApp stepped up user security by implementing end-to-end encryption across all communications channels including group messaging and file transfers. The firm activated full encryption for one-on-one text messages in 2014, a feature also available for VoIP calls. WhatsApp for Mac is available now and can be downloaded directly from the company's website. Setup is similar to WhatsApp's web client and requires users to scan a presented QR code using WhatsApp on iPhone.